COR Safety Solutions makes passing COR, MECOR, and SECOR safety audits easy. We provide small and medium-sized companies with all the safety requirements necessary to work Canada’s oil patch with none of the hassles that are a natural part of complex compliance systems. We provide a bridge connecting large oil field production companies and the small and medium contractors who work for them. On one side, we audit companies large and small and on the other we coach and guide contractors through the COR, MECOR and SECOR,and ISNetworld® submission process. Making Safety and Safety Audits Easy! COR Safety Solutions will supply certified auditors to audit your company in order to obtain your COR certification. A health and safety audit is a comprehensive review of a company’s health and safety system. It covers the basic elements of a health and safety system using personal interviews, a review of documentation and observing operations at the work place. To acquire a COR, you must receive and 80 per cent overall mark with no marks below 50 per cent in any one element of the system. COR Safety Solutions evaluates your safety program, implements solutions and prepares your company for auditing. The cost of COR Safety Solutions’ services can be customized to you and your company’s unique circumstances. Possibly the most challenging project for small and medium-sized contractors just starting out in business is compiling a safety manual to meet ENFORM requirements for a COR, MECOR and SECOR. COR Safety Solutions can assist you in creating and implementing a Health and Safety Manual. If you have already compiled your own quality system manual, COR safety manual, SECOR safety manual or other safety or quality systems manual, we can review your documentation prior to your submitting it for certification and provide advice on how it may be improved to assure acceptance. 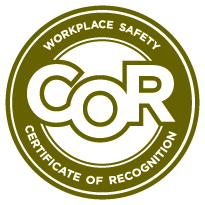 Alberta Construction Safety Association’s Certificate of Recognition (COR) program and SECOR program. Additional sections can be added. COR Safety Solutions provides Safety Forms binders, which contain all the forms and paperwork required to stay in compliance with the program — safety meetings, hazard assessments, inspections, etc. Audits by a certified auditor are required yearly to qualify for and maintain a Certificate of Recognition (COR). COR Safety Solutions can assist your company through each required step ensuring your preparation for each annual internal audit and each external audit, required every three years. These audits are required when a significant event occurs resulting in injury, property damage and loss of production. We have certified auditors on our team of safety specialists that can audit your program or assess your readiness for an audit. Audits are generally carried out by an external auditor to ensure objectivity. When there is an increase in the number or severity of incidents. When there is a change in operational activity or staffing. When a previous audit has identified a high-risk workplace. When a certifying partner requires an audit to meet and/or maintain COR certification. For the Saskatchewan COR program. When a regulatory agency requests that the entire program is evaluated. When a company initiates a system-wide audit on its own. We assess your RAVS® Safety Program Matrix and determine exactly which written programs are required by your customer. We upload the Adobe PDF format directly to ISNetworld’s® website. A safety consultant then completes the questionnaires required for each individual safety program RAVS® section. This step alone will save you many hours of tedious work. If any program receives less than 100 percent passing, we will make any and all required changes at no additional cost to you. Once all written safety programs have received a 100 percent passing score, we will email you the RAVS® information that was submitted. ComplyWorks Ltd. provides relevant compliance with active monitoring solutions in a variety of global industries. These include oil and gas, transportation, construction and forestry. We focus on three levels of business – the employer, the contractor and the worker. We provide each level with the tools needed to set, manage, monitor, and communicate their compliance in every aspect of their business. Filling out ComplyWorks questionnaires can be intimidating and time-consuming. We will assist you in submitting this information and guide you through the online submission process. Please call us to discuss the very reasonable cost of Comply Works Compliance and Comply Works Account Management.